Montreal is the laughing stock of North America when it comes to infrastructure management. Specifically, a legacy of corruption, short-sighted planning, and the sheer incompetence of its political leadership have hobbled one of the largest cities on the continent when it comes to managing traffic and attracting international investment. To this we can now add the hubris of newly-elected Montreal mayor Valerie Plante and Plateau-Mont-Royal borough mayor Luc Ferrandez in deciding to close Mount Royal to automobile traffic in the spring of 2018. Let me explain why this is perhaps one of the worst decisions made by Projet Montreal early on in its mandate. The city is smack in the middle of an enormous infrastructure revitalization plan that has caused commuting chaos across the entire island, with over 600 kilometers (375 miles) of roads being worked on, closed, diverted, or dismantled in any given year. It’s a burden not just in terms of municipal and provincial spending – think close to three quarters of a billion dollars in each 12 month period, depending on whose estimates you choose to trust – but also in the enormous economic impact associated with a metropolis of 4 million people who simply can’t get where they need to go on a daily basis, with no end in sight. Into this steps Luc Ferrandez, emboldened by the political capital afforded him by the tragic accidental death of a cyclist on Camillien-Houde Way in the fall of 2017, to announce a ‘pilot project’ to shut down through-traffic on that same road. The cyclist was killed when a tourist performed an illegal U-turn on an area of the street where that is no longer possible due to the installation of concrete barriers and other safety features that were a long time coming. Ferrandez – who has made no effort to consult citizens, community groups, or indeed anyone at all about the potential impact of his plan – will be cutting Camillien-Houde in half by barring automobiles from a stretch of road that connects the Smith House parking lot from the Beaver Lake parking lot. Effectively, this makes it impossible to use the road to drive from the west side of the mountain to the neighborhoods in the east, and vice-versa. It’s an enormously ignorant and problematic decision for several reasons. Ferrandez, with the support of Plante, is acting to unilaterally shut down one of the few useful east-west thoroughfares in a city effectively paralyzed by a constantly-shifting network of detours and road closures. He is actively taking steps to make it more difficult for Montreal’s citizens to move around a city that is choked with infrastructure construction that already threatens businesses and significant reduces the quality of life of everyone who lives here. The fact that it is being done under the guise of safety – a convenient mantle for Luc Ferrandez to assume as he continues his years-long battle against automobile usage in Montreal – is opportunistic to the point of being sickening. Where were similar closures on other stretches of road that are dangerous to cyclists and pedestrians in this city? More to the point, by closing only a small stretch of the entire road, no additional protections are being offered to pedestrians or cyclists that will continue to share the rest of Camillien-Houde with automobiles, laying bare the true motives behind Ferrandez’s efforts. Moving beyond the fact that two upper level public servants in Montreal are working together to worsen the lives of their constituents, there’s also the balkanization effect that this particular closure will have on citizens who want to visit Mount Royal park. Ferrandez and Plante seem all too eager to import the spirit of the L’Acadie Wall into the 21st century by splitting Cote-Des-Neiges/Notre-Dame-De-Grace from the Plateau with the severing of the Camillien-Houde artery. Stay on your side of the mountain and everything will be fine, they seem to be saying with this latest baffling gaffe. Furthermore, as Allison Hanes pointed out in her piece in the Montreal Gazette, shutting down this stretch of Camillien-Houde effectively cuts off the west side of the park from those living in the east, while eastern dwellers now face a more difficult time accessing amenities found on the west side of the mountain. Beaver Lake, Smith House, summer camps, and even the Notre-Dame-des-Neiges cemetery have now become significantly more difficult to get to depending on where you happen to live. Again, this was a decision made without consulting any of the organizations that regularly use the mountain, nor the citizens to whom it belongs, and who are proud of this unique natural area in the middle of a bustling city. 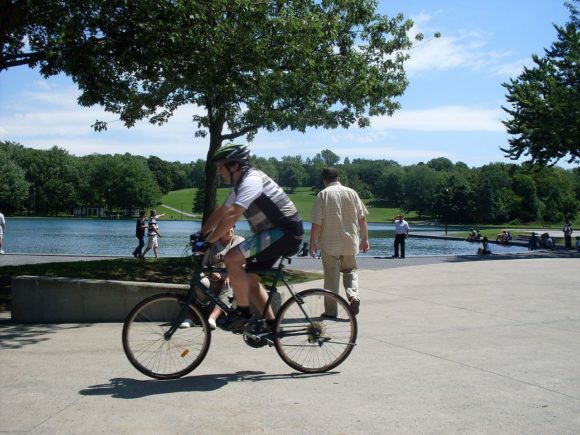 In fact, one organization dedicated to protecting Mount Royal park – Les amis de la montagne – is opposed to the plan and is pressing for public consultations. As a journalist, I frequently travel to major cities around the world and have yet to encounter an infrastructure situation as dire as that here in Montreal. In addition, I am frequently disheartened by comments made by visitors to me about how terrible their experiences with the roads and transit systems – public and otherwise – they were forced to use during their time here. To come to the realization that we are now dealing with an administration content to impose top-down infrastructure policy with little or no thought given to its impact on the citizens it claims to be serving is disheartening at best. At worst, it’s one more black mark on Montreal’s international reputation, and an indication that those in charge have absolutely no idea as to how to ease the immense strain of the city’s crumbling, tattered infrastructure.